Used by Utilities and Government Offices worldwide for the measurement of cable height. Will also measure to the top of lighting columns. - Working at safe distances from live cables. - Installing cables to the correct height. - Ensuring public safety by monitoring cable heights above roads and footpaths. All capable of measuring the lowest wire or cable. Pre-selectable start-up in metric or feet and inches. Air temperature constantly displayed (LCD). Final measurement includes instrument depth. 9V battery for over 50000 measurements. Resolution: 1/8 Inch or 1mm. Error typically less than 0.1% ± 1 digit. Auto power-off time 3 minutes. 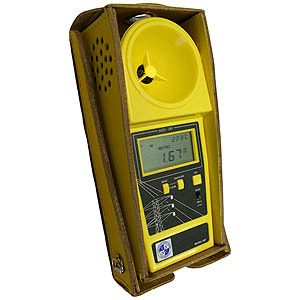 Supplied with yellow leather case and strap. Can be mounted on a Monopod for speed.